Magnificent "Casa De View" in this 14th story Summerwind condo. With plenty of seating and beds for everyone, this will be a great place to stay for a relaxing beachside get-a-way. 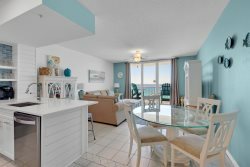 No detail is left undone and your sure to enjoy the home's lovely features including a private Gulf front balcony, ocean views from the master bedroom, a fully equipped kitchen, and flat top kitchen stove and newly updated furniture. Working with the Navarre beach staff was so easy, and stress free! There were no unexpected issues and from day one of booking to after checkout the communication was fantastic.you will be in and out quickly and be able to enjoy Navarre! The stay was nice, we enjoyed it all around. Love having a full condo, we cooked some of our own meals and then enjoyed eating out too. The bbq pits were nice and if you aren't the one grilling you can enjoy the pool! Clean and relaxing.